The presentation was hosted by Joshua Scott & Cassi Niekamp. Joshua is a marketing guru and specializes in the dental field. You can find him at: joshuascott.com Cassi Niekamp works for RevLocal, a firm that specializes in on-line marketing and analytics. When we arrived, we were warmly greeted by Joshua and Cassi. The room was full of other working professionals ranging from dentists, bankers, construction company owners, and even a chiropractor! We mingled with these other guests while partaking in some delicious hors d’oeuvres and beverages. The presentation was excellent and gave us some more “food for thought” as far as marketing in the future. It’s always helpful to keep abreast of the latest trends and practices. We also really enjoyed both the knowledge of the presenters as well as their passion for the work that they do. We walked away with some new ideas and strategies to implement at Sugar Fix. 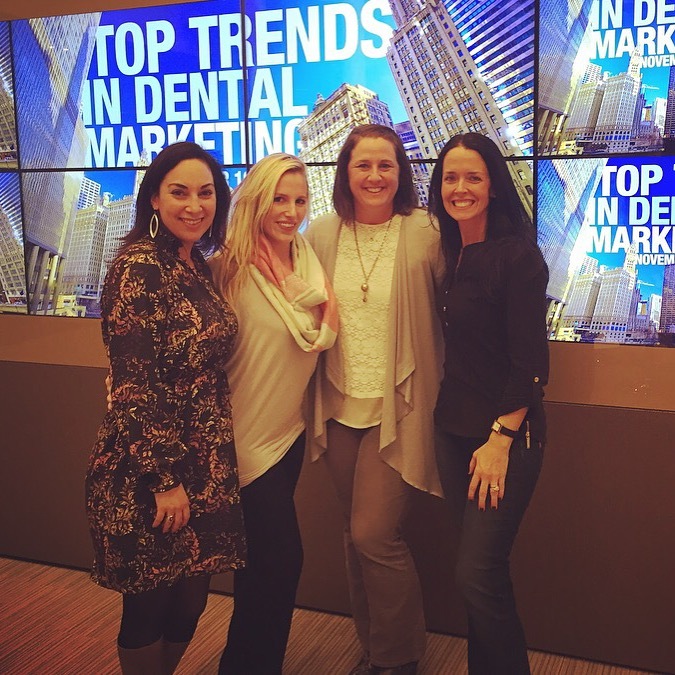 Dr. Emery, Lauri, Ashley, & Dr. Alia attend a dental marketing presentation in Chicago.